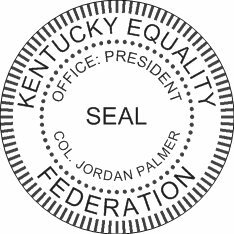 On Tuesday, September 10, a lawsuit was filed on behalf of the Kentucky Equality Federation against the Commonwealth of Kentucky. This lawsuit is the latest attempt to achieve equal rights and protections for families across the Commonwealth whose very existence has been banned by the forces of religious zealotry and hatred. 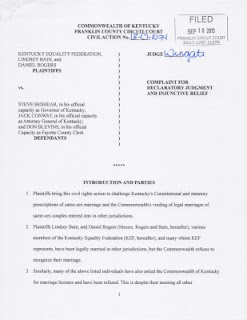 NOTE: A complete digital copy of Kentucky Equality Federation v. Commonwealth of Kentucky is available here in PDF format, the Case # 13-CI-1074. The lawsuit was conceived by President Jordan Palmer, written and signed by Vice President of Legal Jillian Hall, Esq., and Mark A. Morenz-Harbinger, Esq. At the heart of the suit is the premise that the 2004 amendment to the Kentucky Constitution was passed in violation of the Constitution. "In 2004, social conservatives, who normally try to hide behind the Constitution, decided that it wasn't good enough for them anymore," said Kentucky Equality Federation President Jordan Palmer. They decided to rewrite a document which guarantees freedom and to pervert it to fit their own jaded hatred of gay and lesbian couples. This was done despite the fact that it negated part of the bill of rights. We, as Kentuckians, must undo this immoral amendment which subverts the soul of our Commonwealth, our rights, and the government of Kentucky. Lawmakers in Frankfort put something to the people for a vote that was unconstitutional if you read Kentucky’s constitution. The Kentucky constitution is the supreme governing document of the commonwealth; its provisions provide GREATER freedoms than the U.S. constitution. Kentucky added a facially unconstitutional amendment to its constitution via a ballot initiative process. 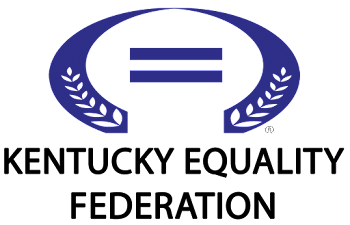 Thus, the attempt to abrogate constitutional sensibilities in favor of a ballot initiative, as was done for Section 233A of the Kentucky Constitution in 2004, is against the very notion of equal protection as guaranteed to each and all of Kentucky’s population. This should be held as true as a matter of law by the Courts, regardless of the ballot’s outcome." "Fear of the LGBTI community reached a high-water mark after DOMA," said Kentucky Equality Federation Vice President of Policy & Public Relations Joshua Koch. "Roving bands of lobbyists funded by extremist elements traveled the country for years vandalizing generations-old institutions and spreading lies and fear in several states. In 2004, they struck Kentucky, traditionally a leader in the region on civil rights, and managed to apply their graffiti to the Constitution, which had been in effect for 113 years. We are simply trying to undo the damage done."